The attack on the twin towers of 9-11 had Claire Coleman making a list of all the people she knew who were missing, and praying for them. After a few days it became apparent that not one had survived. However, even after she knew that, she couldn’t bear to tear up that list. Instead she used it as a reminder to pray for each victim’s shocked and grieving loved ones. That September day only brought into focus what Coleman had been taught from a child—the importance of caring for others and the power of God to work in lives when we pray. 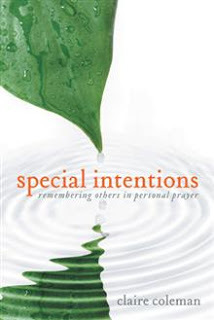 These two convictions are the foundation of her book Special Intentions: Remembering Others in Personal Prayer . The book is made up of an Introduction (where the author tells the story of how the book came to be written and how to use it) followed by ten chapters. Each chapter consists of portraits of people types to pray for (a sample of those types: “The Black Sheep of the Family,” “The Soldier,” “The Child of an Alcoholic,” “Victims of Persecution,” and about 190 more). The portraits are presented as free verse poems, one per page. The book is really not meant to be read through quickly but taken in one page at a time, perhaps one a day, as a reminder to pray for the group of people described. Why would we do this? Coleman acknowledges that praying for people we don’t know may not reward us in tangible ways. But she explains it as an extension, into the realm of prayer, of the caring we do for other human beings whether we’re rewarded or not. there is guilt, shame, depression, anxiety …. and a way to move forward in their lives” – from “Accidents Happen,” p. 97. The title Special Intentions seems apt. Its play on the phrase “good intentions”—what we have when we promise someone we’ll pray for them, even though we don’t do it—brings home the fact that prayer is intentional, and there are a lot of special people in the world who need prayer. As I’m working my way through this book, I am noticing it is doing more than only challenging me to pray for the people described. It is also drawing my attention to the people on the periphery and behind the scenes in my world, and I’m praying for them. And so Claire Coleman’s Special Intentions ripple on. The book has its own website and a blog where Coleman writes about how she is trying to live out the principles in her book. ← Writing different genres – should you?